Living life with a healthy outlook! Who got me a stripper?? It has been a busy week and a half for me! Just about two weeks ago I got to help one of my best friends celebrate her 30th birthday with an amazing party at a local bar. I donated a hotel room to the cause, which was the site of a little girl bonding time while we were getting ready and an after party. Of course, it wouldn’t be a party that I was at (or hosting) unless there was a random pop-in by the police. No… We weren’t that awful! I am in my 30s… I am somewhat respectful (shush). The people a few rooms down weren’t all that respectful, though, and filled the hall with some very rank weed smoke. Blech! The cops heard our music, stopped by, and of course I made friends with them. Sometimes, making a police officer laugh (in this case five police officers laugh) is enough for me. Brings me back to my birthday when my cousin, Sarah, and I moved into together when I was right out of college. We were pre-gamming prior to going out to the bar when there was a pounding on the apartment door. Me, being me, got up to answer the door and on the way to the door says loudly… “Which one of you guys got me a cop stripper?? ?” I open the door, and who else would be standing there but a police man. I don’t know whose face was more red… Mine or his. Turns out he was looking for the previous resident. Good laughs all around for that one. The Monday after my friend’s birthday I started the Whole30 again. I did this once before a few years back to help get my body rid of toxins and launched into a year of paleo eating. I have pretty much eaten clean since, taking learning’s of my paleo stint into my cooking, but felt the need to get my system clean of hormones and toxins. I’m now a week and a half into it and feel pretty good. Not going to lie… The first few days were hell… My body wanted SUGAR!!!! I stayed strong and maintained composure (sorry to my coworkers if I was snappy last week). Last night I wanted to do something different for dinner. I was doing just meats or eggs and veggies for dinners and lunches since I was low on time, but last night I felt inspired. I had a leftover cooked acorn squash from the previous night that I wanted to use for D and I, and I wanted to stuff it. 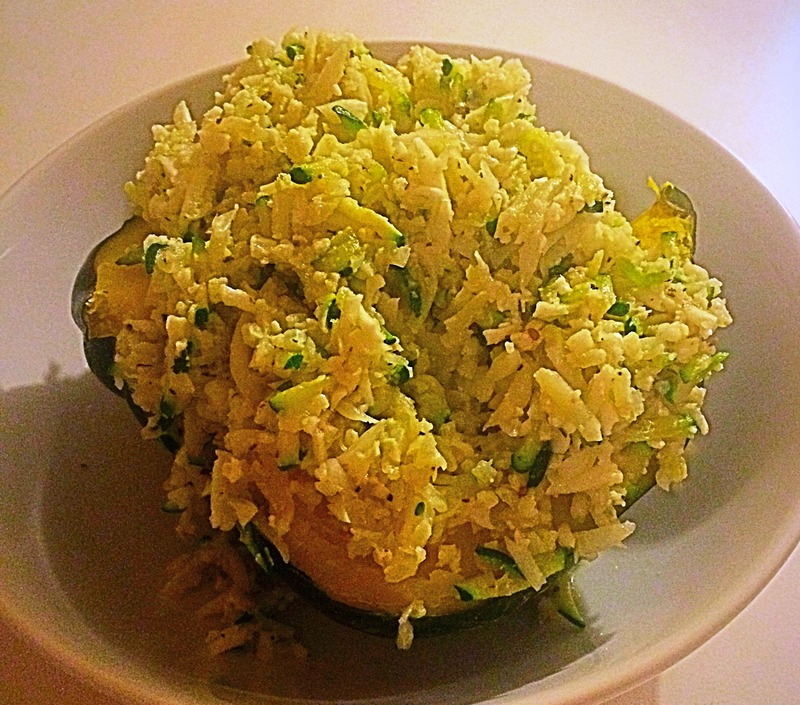 One of my favorite acorn squash recipes is a turkey stuffed acorn squash with rice and butter and cheese… Well, three of those things are not allowed on the Whole30, so I got to brainstorming, and this is what I came up with. Prepare food processor with the shredding blade attached. 2. 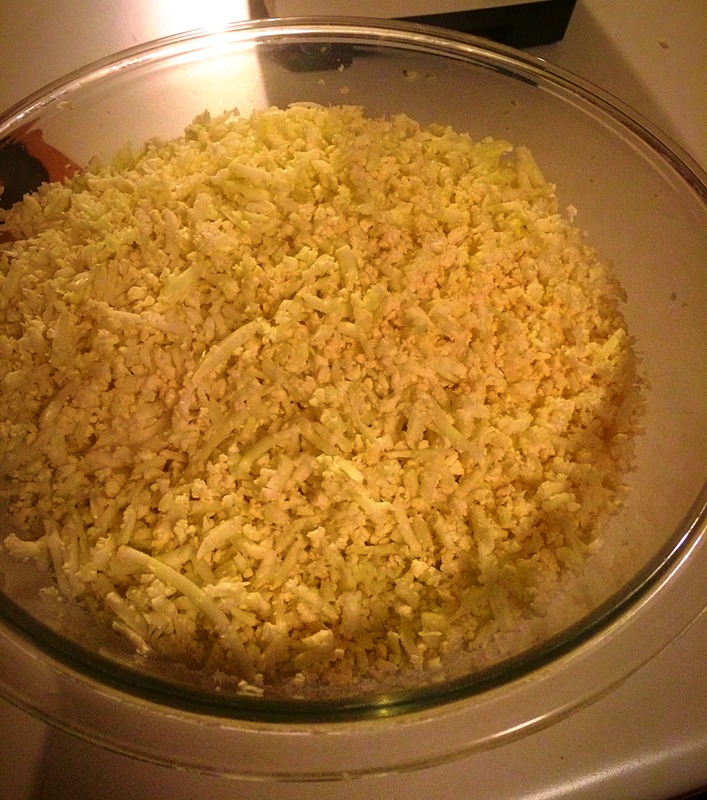 Slice cauliflower so that it fits in your food processor funnel, and go to town. Mini Me enjoyed helping me with this. She was the official button-presser. 3. 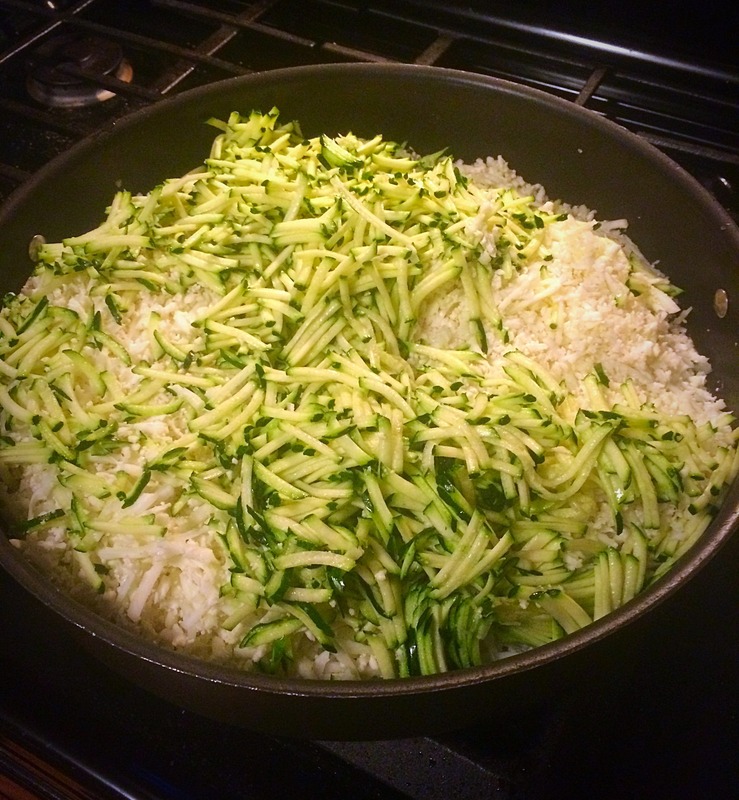 Once all of your cauliflower is “riced”, pour into a bowl and set aside. 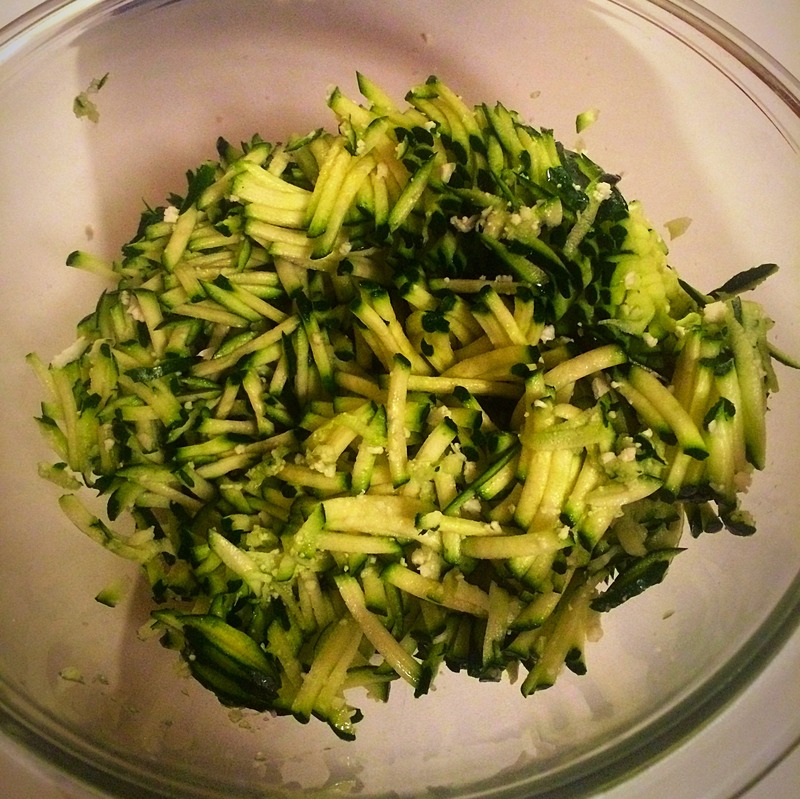 Cut the ends off the zucchini, and shred away! Pour into a bowl and set aside. 4. Repeat shredding process one last time with the onion and garlic cloves. 5. 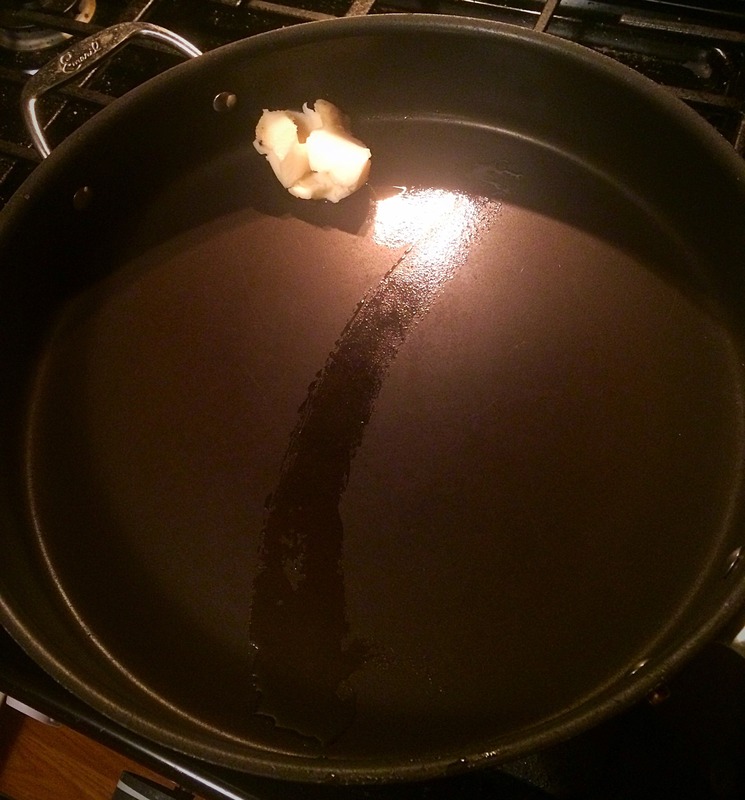 Heat a large skillet over medium heat. Add 2T of bacon fat until melted. 6. 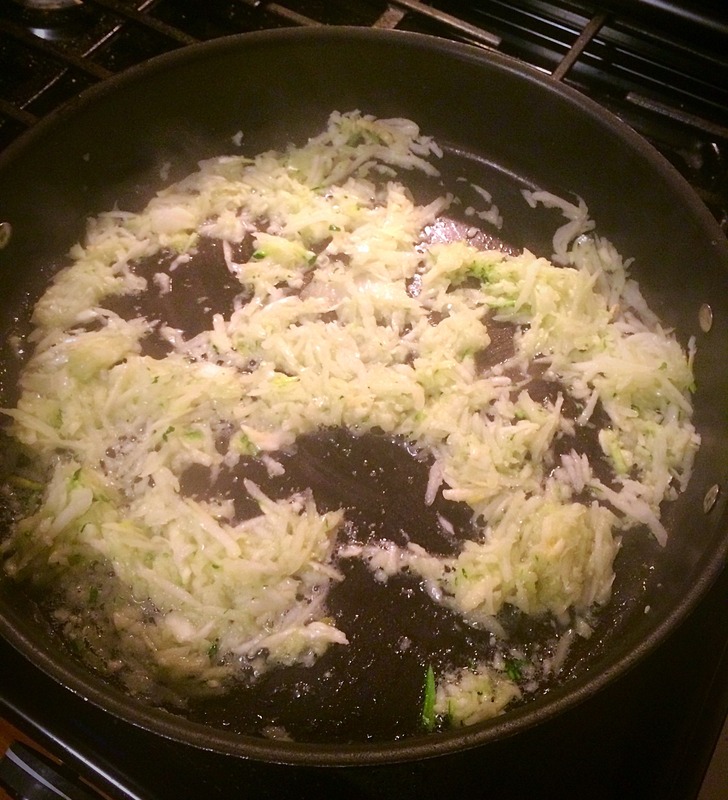 Pour in onion and garlic combination and sauté for a few minutes (until fragrant). 7. 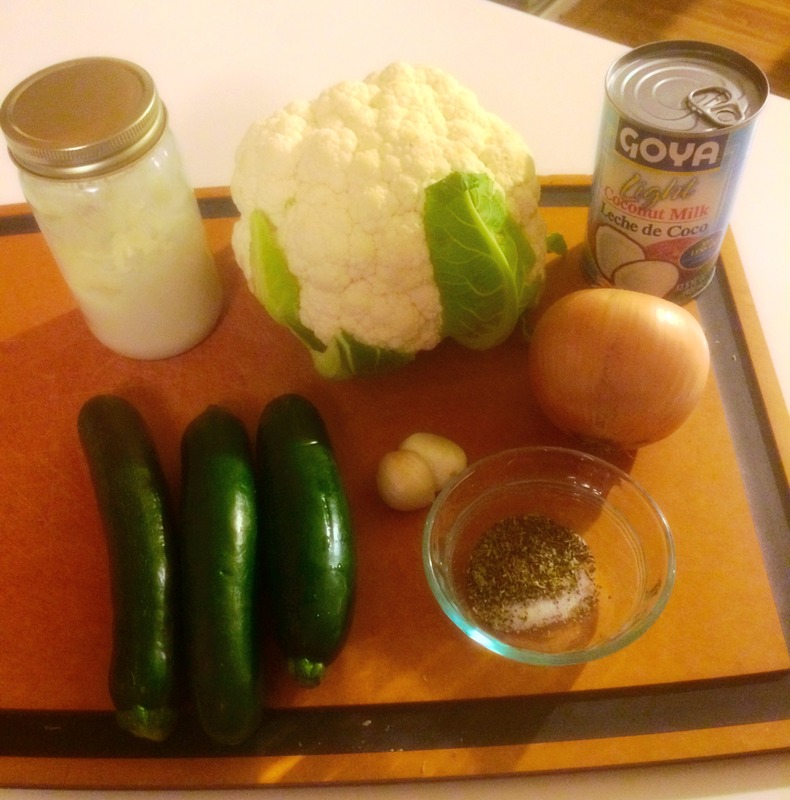 Add coconut milk, cauliflower, zucchini, nutritional yeast, salt, pepper, and herbes de provence. Stir to combine, reduce heat to low, and simmer for 12-15 minutes stirring occasionally. This cauliflower rice can be used alone as a side, topped with a meat, over easy eggs (yummy breakfast this morning), or as a stuffing for various other vegetables. Hope you enjoy as much as we all did!! Makes around 6 large servings. It’s Friday, it’s Friday, it’s Friday!! Now imagine me doing a little dance while singing that (off tune, most likely). It has been a week of ups and downs. A week of refocusing on nutrition and exercise. A week of nose-to-the grind working in the office. But… It’s FRIDAY!! Friday’s used to mean ordering takeout sushi with D, and waiting until Mini Me went to bed so we could eat our sushi in peace and watch a movie. There was generally overindulging in food (yum sushi) and sometimes alcohol. Over the past few weeks I realized that things I was doing in the past have not been helping me reach my weight loss goals. I’ve been diligent on hitting my macros this week, inspired by my friend, Austin, and have reaped the reward… A 4.2lb weight loss this morning! Wooo! As a mini celebration and a treat to myself, I wanted to have a munchie while watching a movie tonight. My macros didn’t allow for my second favorite food today, either… Popcorn. So I set off in search of something flavorful and crunchy (yes I had veggies today) to munch on while relaxing. 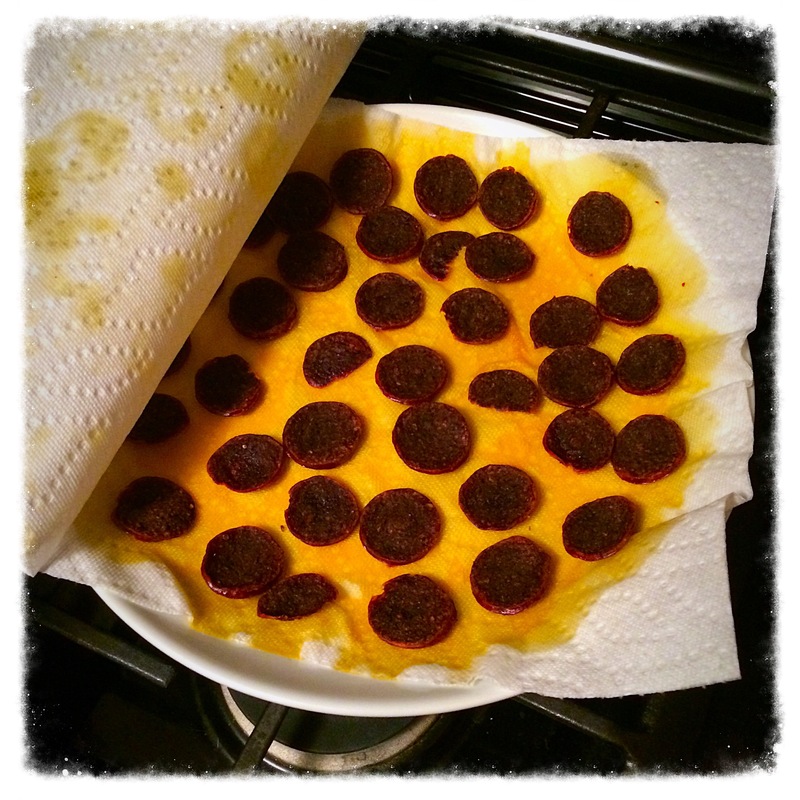 Enter… Pepperoni Chips! These little want to be chips are packed with protein and have little to no carbs. They do have a bit of sodium, so remember to keep drinking your water!! 1. 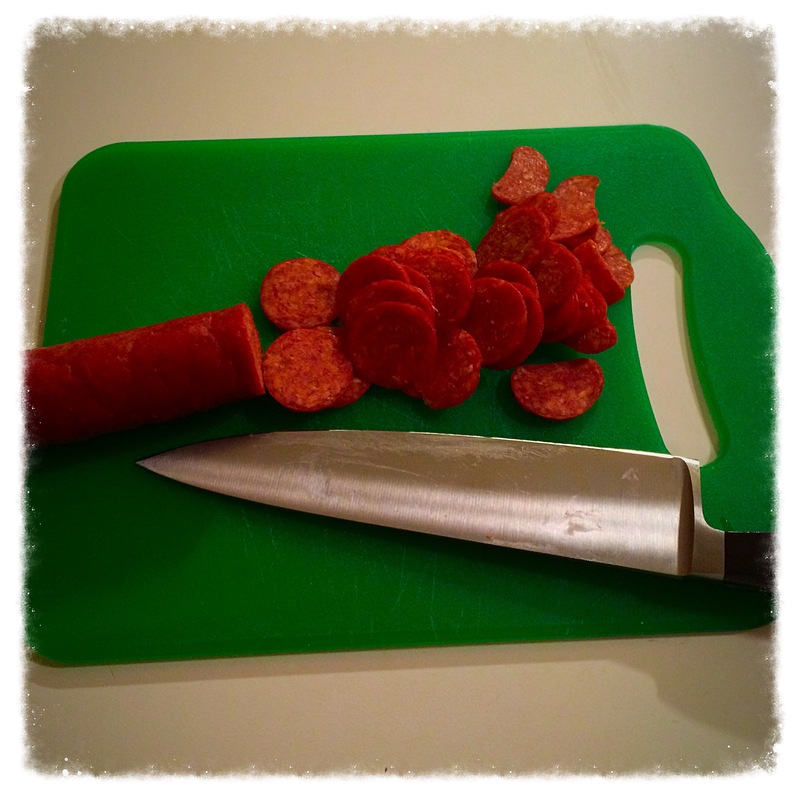 Slice pepperoni thinly, or buy precut slices. 2. 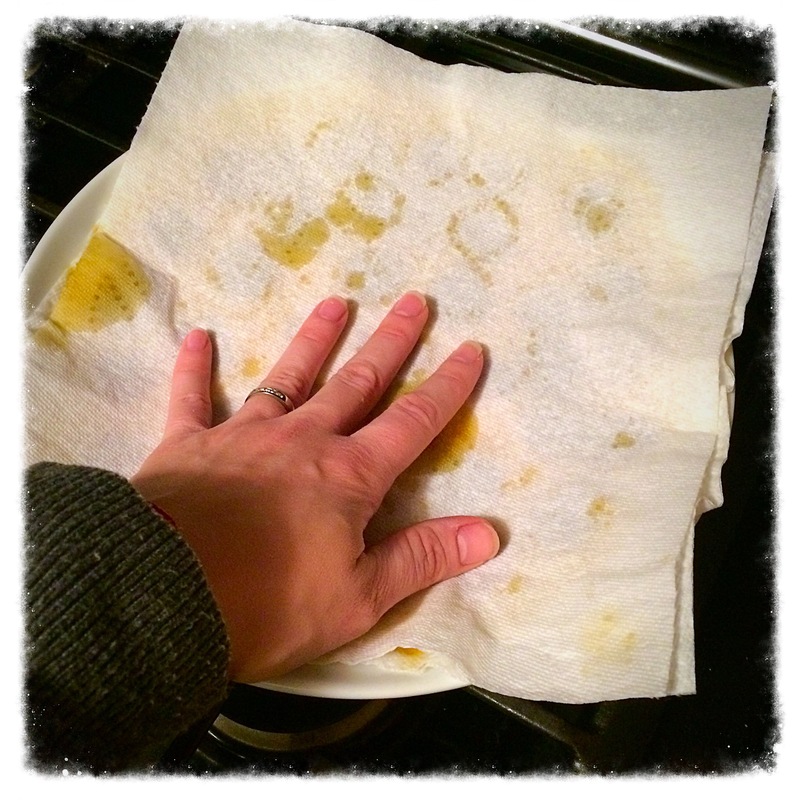 Layer a paper towel or two on a plate to absorb any grease. 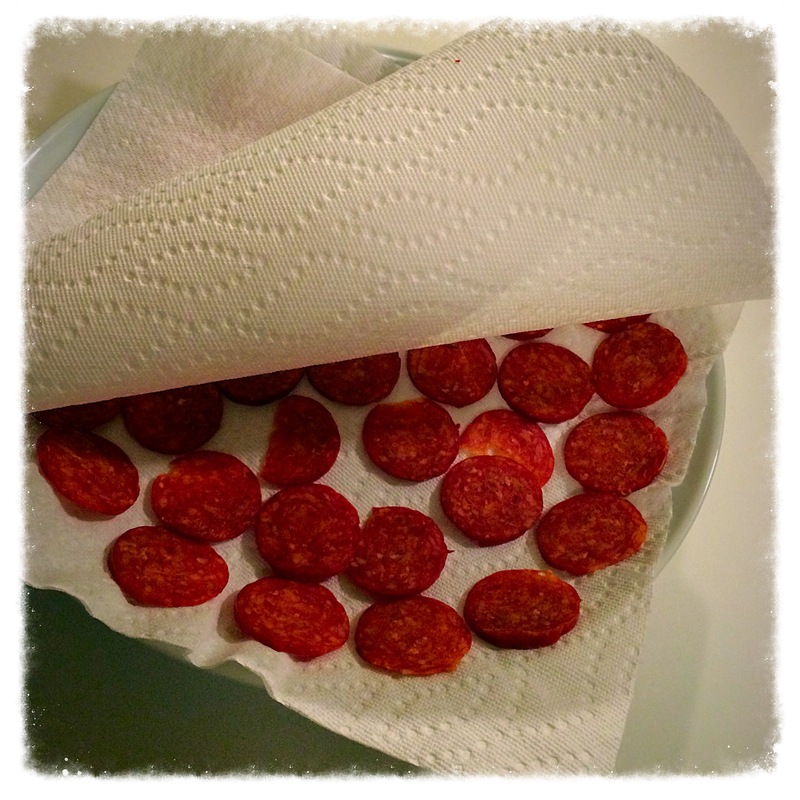 Lay slices of pepperoni on the paper towel covered plate and cover with another paper towel to help minimize any splatters. 3. Microwave a large plate of slices for 3-4 minutes, or until the centers don’t feel rubbery. Blot extra grease from the top by lightly pressing on the top paper towel. 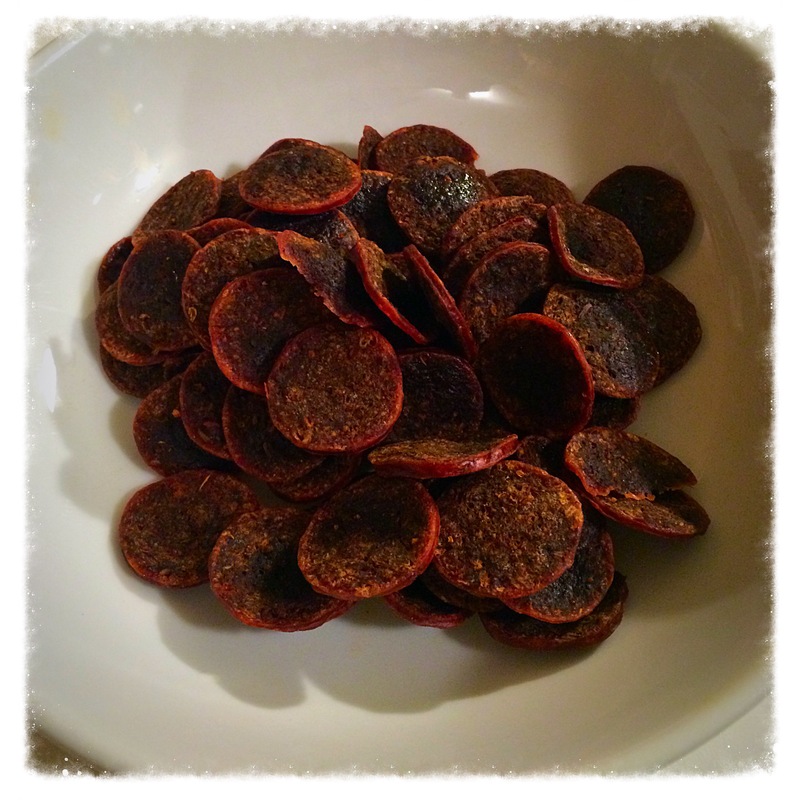 Note: my pepperoni didn’t completely crisp up until about 5 minutes after removed from the microwave. Now, sit…enjoy…and let’s start our movie!